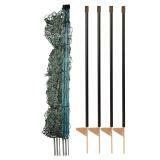 PoultryNet kit - Choose either single spike or double spike netting and 4 additional posts for corner and end support. 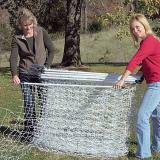 Use this netting kit to contain and control flighty birds while protecting them from unwanted predators. 48" tall. 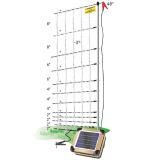 You will need a fence energizer (see accessories tab) to electrify the net. Recommended for active, flighty birds (e.g. Leghorns and Buttercups) and protection from large predators such as coyotes and dogs. 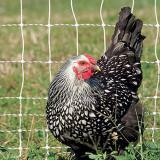 For heavy, non-flying breeds, look to 42" PoultryNet kits, which is shorter and easier to handle. 100 or 164 ft roll of 48" PoultryNet with either single spike or double spike posts. 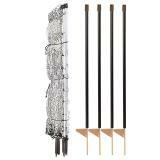 4 48" FiberTuff™ support posts. 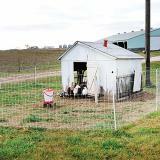 PoultryNet “Plus” is identical to standard 48" PoultryNet, but to help with sagging, we’ve added more posts to shorten the distance between them (6'8" vs. 10'). 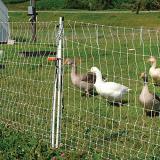 More posts means less sag and a more versatile fence which adapts easily to curves and hills. Double spike posts are more stable in soft soils. 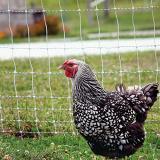 100 or 164 ft roll of 48" PoultryNet or PoultryNet Plus single spike or double spike electric netting. 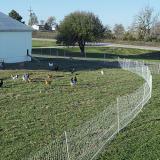 PoultryNet 12/48/3 is a 48" electrifiable prefabricated fence. It arrives at your door as a complete roll with the single spike or double spike posts already built into the mesh/fence. 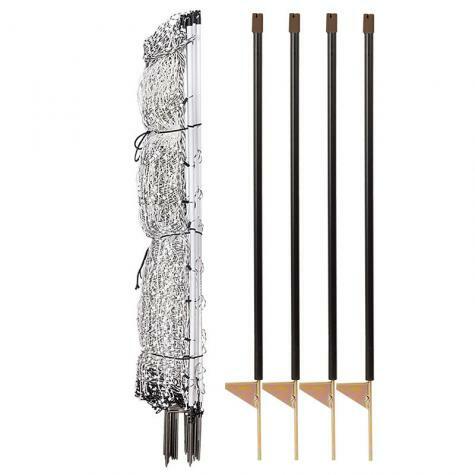 Features 12 horizontals strands (11 conductive) with vertical strings placed every 3". “Plus” nets include additional line posts spaced every 6'8" to reduce sag. Add more rolls for a larger enclosure. Number of reviews: 68 customers reviewed this product. Recommended: 66 out of 68 said they would recommend this product to a friend. 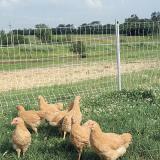 I purchased a 100 foot fence with a Solar IntelliShock 60 for protecting the chickens on my homestead. 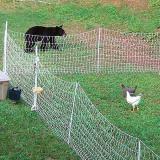 I was able to use it right away and moved my flock onto a garden plot where they are happily prepping the area for me. I have a few young roosters getting that have become interested in hens. This has caused a few escapees over the top. No losses however and the flock has had their wings trimmed. Now they all stay put. Product quality is great. Although I have not had issues with it I would recommend Velcro or stretchy straps that are easy to remove and install where the fence ends come together for better simpler closure. 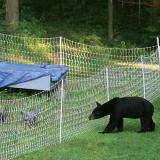 This fencing is frustrating to use if you have uneven terrain, rocky/clay soil, or fast growing vegetation. Falls down or sags every time it rains and requires numerous additional support posts to keep it off the ground. I have the 100' [“Plus”] green fence with the double spike posts and it's great. This version is terrible and is made for flat ground and perfect conditions unless you use t-posts to keep it from falling over. Then it's not easily movable which defeats the purpose of buying this type of fencing. I wish I could exchange this fence for another green one.